Calif., Nov. 5, 2013 — CoreLogic® (NYSE: CLGX), a leading residential property information, analytics and services provider, today released its September CoreLogic Home Price Index (HPI®) report. Home prices nationwide, including distressed sales, increased 12 percent on a year-over-year basis in September 2013 compared to September 2012. This change represents the 19th consecutive monthly year-over-year increase in home prices nationally. On a month-over-month basis, including distressed sales, home prices increased by 0.2 percent in September 2013 compared to August 2013*. Excluding distressed sales, home prices increased on a year-over-year basis by 10.8 percent in September 2013 compared to September 2012. 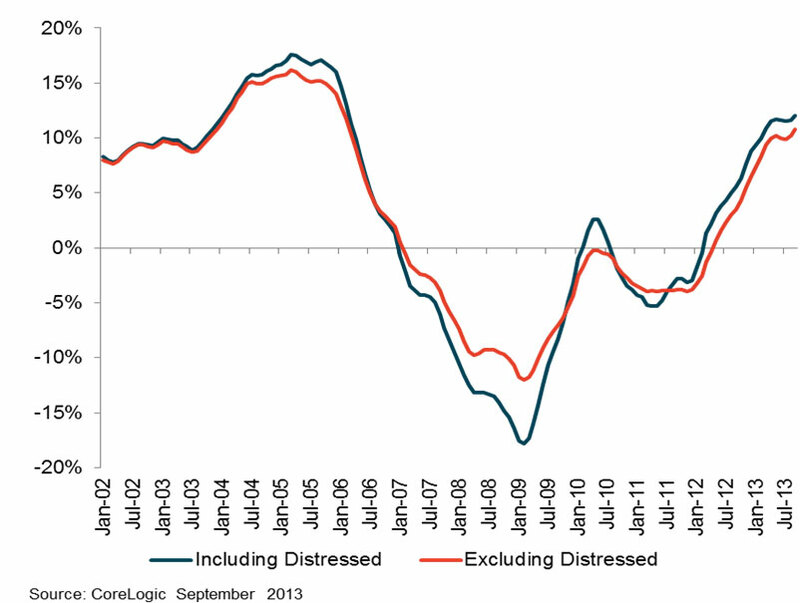 On a month-over-month basis, excluding distressed sales, home prices increased 0.3 percent in September 2013 compared to August 2013. Distressed sales include short sales and real estate owned (REO) transactions. The CoreLogic Pending HPI indicates that October 2013 home prices, including distressed sales, are expected to rise by 12.5 percent on a year-over-year basis from October 2012 and rise by 0.1 percent on a month-over-month basis from September 2013. Excluding distressed sales, October 2013 home prices are poised to rise 11.2 percent year over year from October 2012 and by 0.1 percent month over month from September 2013. 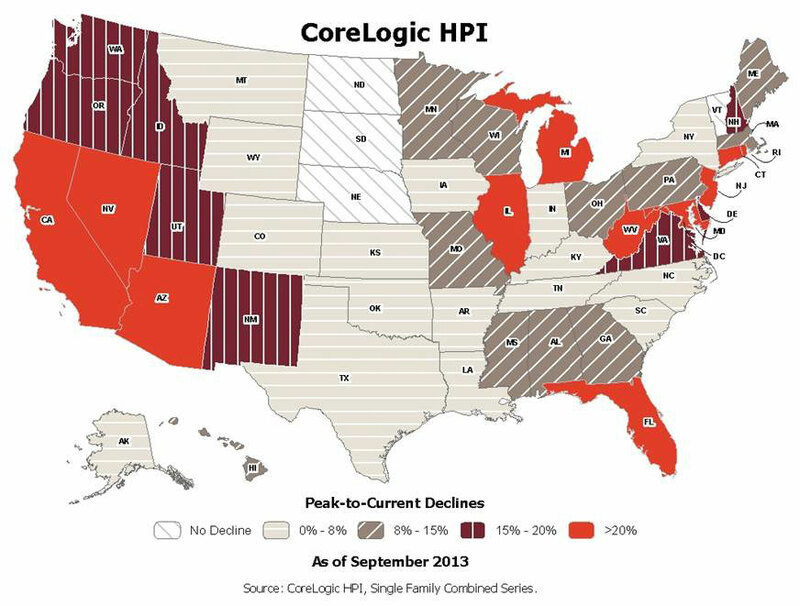 The CoreLogic Pending HPI is a proprietary and exclusive metric that provides the most current indication of trends in home prices. It is based on Multiple Listing Service (MLS) data that measure price changes for the most recent month. "September marked the unofficial five-year anniversary of the start of the housing crisis," said Dr. Mark Fleming, chief economist for CoreLogic. "The five-year home price appreciation for all homes in the nation was 3.4 percent. 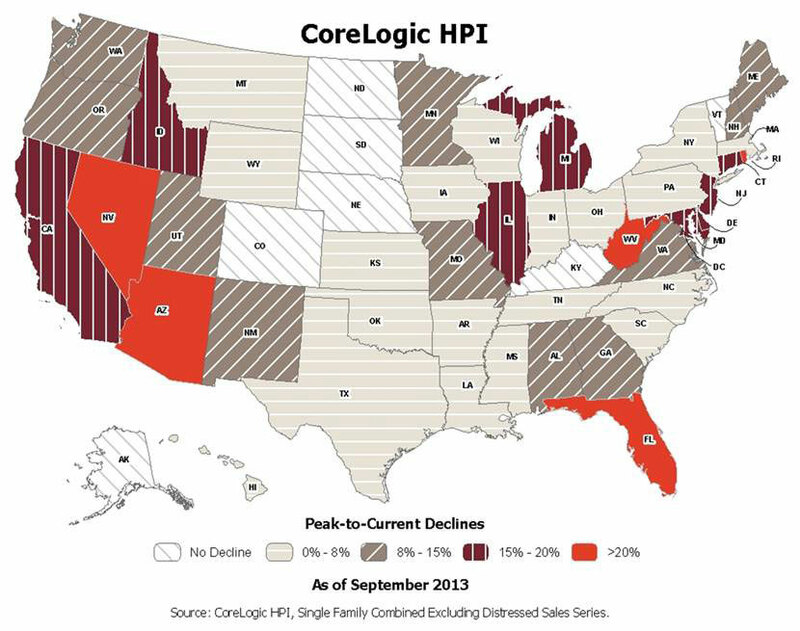 While there is still room for improvement, the CoreLogic HPI is at the highest level since May 2008." "U.S. home prices continued their ascent in September. Average home prices in nearly half the states are now within striking distance of their pre-downturn pricing peaks," said Anand Nallathambi, president and CEO of CoreLogic. "We are seeing a slowdown in the rate of price appreciation over the past few months from the rapid pace experienced over the first half of this year. This deceleration is natural and should help keep market fundamentals in balance over the longer-term." Including distressed sales, the five states with the highest home price appreciation were: Nevada (+25.3 percent), California (+22.5 percent), Arizona (+14.6 percent), Georgia (+14.4 percent) and Michigan (+13.9 percent). Including distressed sales, no states posted home price depreciation in the month of September. Excluding distressed sales, the five states with the highest home price appreciation were: Nevada (+22.4 percent), California (+18.9 percent), Utah (+13.2 percent), Arizona (+12.6 percent) and Florida (+12.6 percent). Excluding distressed sales, no states posted home price depreciation in the month of September. Including distressed transactions, the peak-to-current change in the national HPI (from April 2006 to September 2013) was -17.4 percent. Excluding distressed transactions, the peak-to-current change in the HPI for the same period was -13.1 percent. 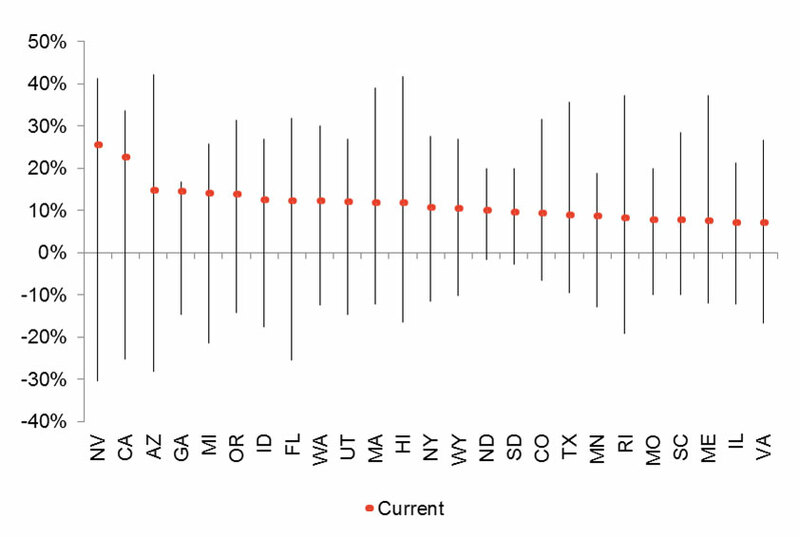 The five states with the largest peak-to-current declines, including distressed transactions, were Nevada (-41.4 percent), Florida (-37.7 percent), Arizona (-32.1 percent), Rhode Island (-28.3 percent) and West Virginia (-26.5 percent). 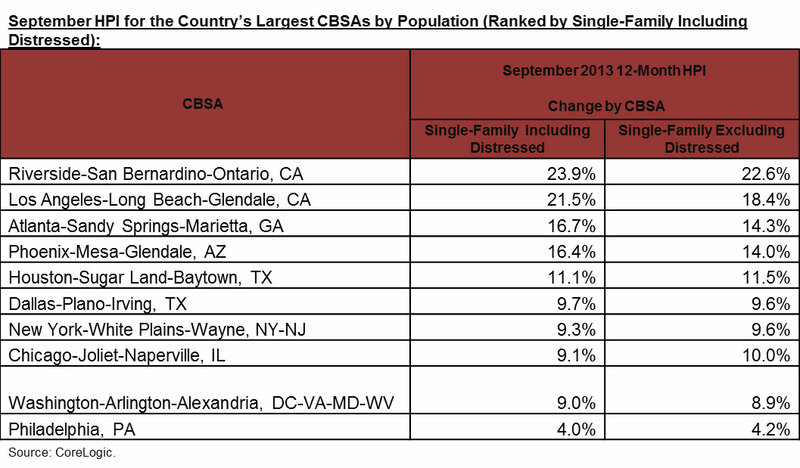 All of the top 100 Core Based Statistical Areas (CBSAs) measured by population showed year-over-year increases in September 2013. The CoreLogic HPI™ incorporates more than 30 years’ worth of repeat sales transactions, representing more than 65 million observations sourced from CoreLogic industry-leading property information and its securities and servicing databases. The CoreLogic HPI provides a multi-tier market evaluation based on price, time between sales, property type, loan type (conforming vs. nonconforming) and distressed sales. The CoreLogic HPI is a repeat-sales index that tracks increases and decreases in sales prices for the same homes over time, including single-family attached and single-family detached homes, which provides a more accurate "constant-quality" view of pricing trends than basing analysis on all home sales. The CoreLogic HPI provides the most comprehensive set of monthly home price indices available covering 6,948 ZIP codes (58 percent of total U.S. population), 647 Core Based Statistical Areas (86 percent of total U.S. population) and 1,227 counties (84 percent of total U.S. population) located in all 50 states and the District of Columbia.